About white blouses, Designer Carolina Herrera, 74, has said: “They are my security blanket. They're very feminine, and when I'm getting dressed in the morning and can't decide what to wear, a white blouse always fits the bill…They're very flattering, because they light up one's face.” To this white blouse endorsement, I would add two more things. First, the white blouse doesn’t discriminate against age. It looks lovely on women of all ages. And, secondly, there is nothing ho-hum about a white blouse. Case in point: Uma Thurman, wearing a white blouse while dancing with John Travolta in Pulp Fiction. Or how about that frisky Elaine Stritch, who wore nothing but a white blouse and black stockings for her one-woman show in 2001? She was 76. For all these reasons, the white blouse is a must-have in this over 50 woman's closet. Is there anything you can’t wear with a white blouse? I can’t think of anything. Personally, I love the crisp, cool look of black and white outfits. So…pairing a white blouse (Shop AnnTaylor.com ) with a black and white skirt and a black shawl is a favorite over 50 outfit. I also love the way a white blouse looks with this season’s trendy neutrals—beige and pale grey. 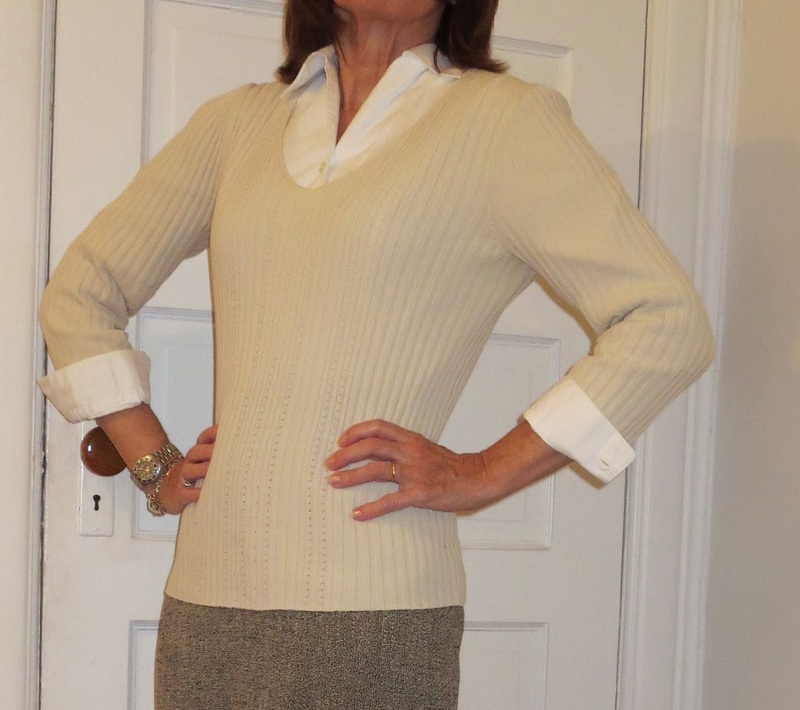 For the next two examples, I’m wearing a ¾ sleeve white blouse (Foxcroft). 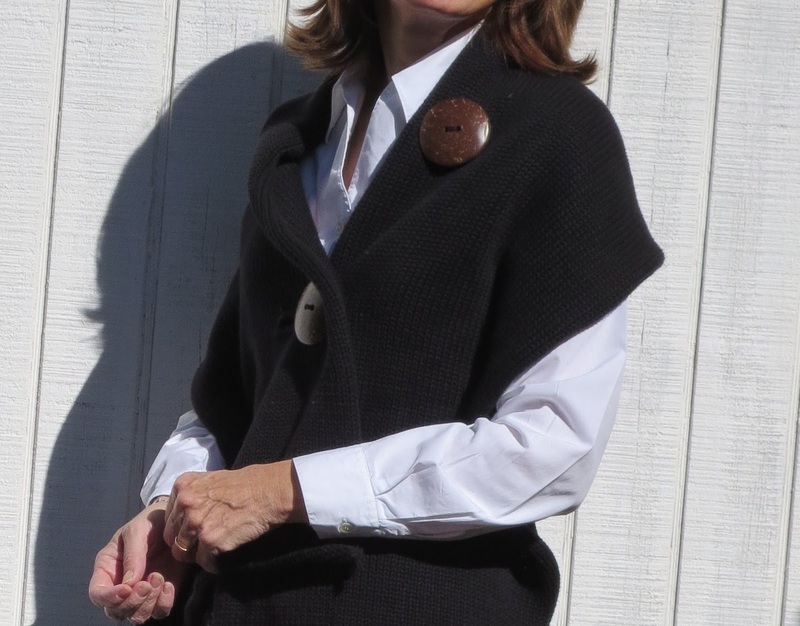 I like to roll the cuff of the blouse over a ¾ sweater. My favorite white blouses are fitted. In my experience, only tall, pencil-thin women can really pull-off boxy fashions. A fitted blouse also looks good alone, without a cardigan or blazer. I love the simplicity of wearing a ¾ sleeve white blouse with a pale grey skirt. Talk about easy dressing in the morning for work! Some days, I want to break out of my ultra-conservative pencil skirts and wear something with a bit more pazazz. I do not, however, want to look like a silly old woman. A white blouse is a great way to temper a spunky sweater, skirt or accessory. Here I’m wearing a green skirt that borders on neon. (The first time my husband brought it home from the dry cleaners, he said, “Is this yours?”) It’s hard to see, but the skirt has four curved pleats at the hem, making it flare a bit. 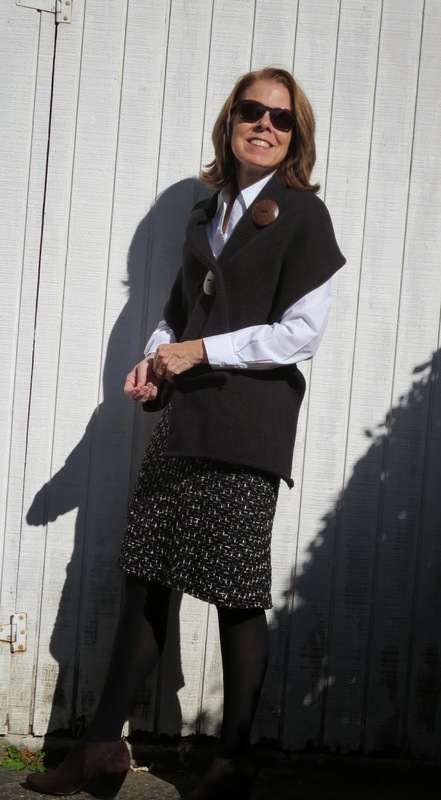 This over 50 style watcher doesn’t like to spend wads of money on clothing. However, I will spend a little extra on a white blouse because it is such a versatile piece. Also, a white cotton blouse looks best when it’s made of good quality material (that looks crisp after ironing) and has good-quality buttons. Both my Ann Taylor Petite Perfect Long Sleeve Button Down Shirt and Foxcroft white blouses have held up really well after many, many washings. I’ve also had good luck with Jones New York No-Iron Easy Care Fitted Shirt (White, Size 12) . How do you style a white blouse? Style Over 50: Great Graphics!